Yeah, I know, 2016 was a terrible year. Happy to see the backside of it. In 2017 I want to simplify things. I am still babying my hip a little -- which translates as "I'm not running much, and only have two half marathons on the calendar. 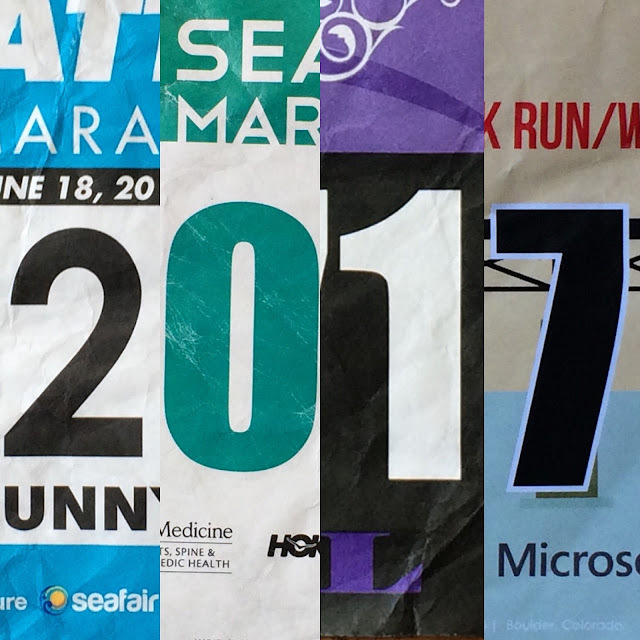 Yes, that's right: TWO HALF MARATHONS IN 2017. That's enough. But our real goal, of course, is Kilimanjaro, where we're headed in August. As such, my goals for the year are to prepare for that trip. So here goes. 1. Follow Jenny's training plan. Jenny has sent us a detailed training plan to prepare for our climb, and my main goal is to follow it as much as possible. Sure, the dates of the workouts will shift a little, but I want to get at least 5 of the 6 workouts per week done. 2. Get out and hike every weekend. Now, obviously, this is part of the training plan, but it seems challenging enough to list out as a separate goal. It's going to be great getting out and hiking in our beautiful state. 3. Climb Mt. St. Helens. Quick update: I managed to get a pair of climbing permits for our weekend of choice, so that hurdle is complete! We'll climb -- and hopefully summit -- on July 22. Climbing on the volcanic scree will be good preparation for Kili. This is part of getting ready for our climb -- I want to be able to sleep comfortably in a tent. This will also give us the chance to test out our gear a few times. 5. Get to Kilimanjaro in good health. I know this sounds like a weird goal, but I really want to train smart and stay healthy this year. So I'm going to listen to my body, not push too hard, and get the rest I need. 6. Reach Gillman's Point on the crater rim. I really want to reach the crater, at least. I keep going back and forth -- is it smart to set a secondary goal for Kili? Is it smart to set any goals at all? At the end of the day, the REAL goal is to come back from the mountain healthy. But I would like to at least get to the rim. 7. Reach Stella Point on the crater rim. It's the only part of Kilimanjaro named after a woman, and I'd like to see it. It's just a short ways beyond Gillman's point. 8. Reach Uhuru Peak -- the summit of Mount Kilimanjaro. Again, I feel edgy setting this as a goal. But I know I'm smart enough not to push past my point of no return to get there. And goals are good, right? Uhuru Peak is just a short ways beyond Stella Point. At the end of the day, it's not all up to me -- the mountain decides. But I hope we have a great climb.